During the winter, my skin gets so dry that it will crack and bleed. I keep a lot of lotion on hand to help with this problem. Recently, I received a new body wash to try since I am a menber of the Purex Insiders. 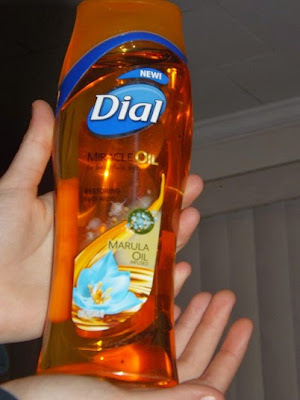 I received the Dial Miracle Oil Body Wash that is infused with Marula oil. My daughter grabbed it as soon as the sample arrived and took a shower. She LOVED it! All I kept hearing from her was how good it smelled and how soft her skin felt. Later that evening I decided to try the Dial Miracle Oil Body Wash for myself. A small amount yielded a rich lather and since I needed to shave my legs, I decided to use this instead of shaving cream. The scent is wonderful and the body wash left my skin feeling silky and nourished. My legs did not feel like they were thirsting for lotion. My skin felt soft and actually looked healthier. Kat was right. This is a product that I will be purchasing over and over. I've recommended it to my family and now I am offering you a chance to try it for yourself! 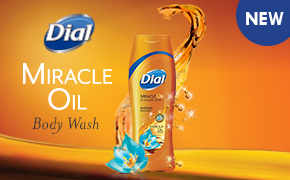 Two lucky Shelly's Bits and Pieces readers will receive a coupon for a FREE bottle of Dial Miracle Oil Body Wash. Entering is easy. Simply fill out the rafflecopter form below. I would definitely get the most use out of this body wash, although I'm sure everyone in the house would be eager to try it! My husband and I would both get a lot of use out of this...he wouldn't admit that he uses it though :). I would get the most use out of this bodywash. I would of course, my skin need moisturizing after this harsh winter. I'd use it the most. I would get the most out of this. I could really use it. my boys would get this. They have perpetually dry skin.